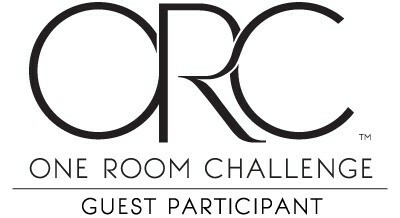 The One Room Challenge 6 week space makeover is in full swing now. That means only 3 weeks until full reveal. Not going to lie, feeling the pressure now. If this is your first time finding me, welcome to my blog. I’m Sonya and thrilled to want to check out what I am up to. This week is all about the dirty work. The stuff that we all hate doing but must be done in order to get to the good part. Our deck is in need of lots of love. First up was the cleaning. I’m still not sure I will actually stain it. The up keep on it may be more than I am willing to tackle. 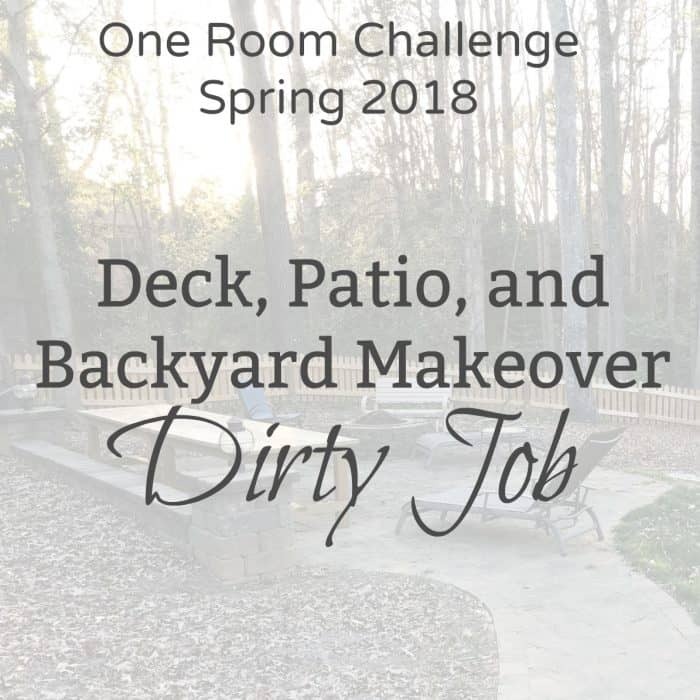 I asked over on my Facebook page about deck cleaning. 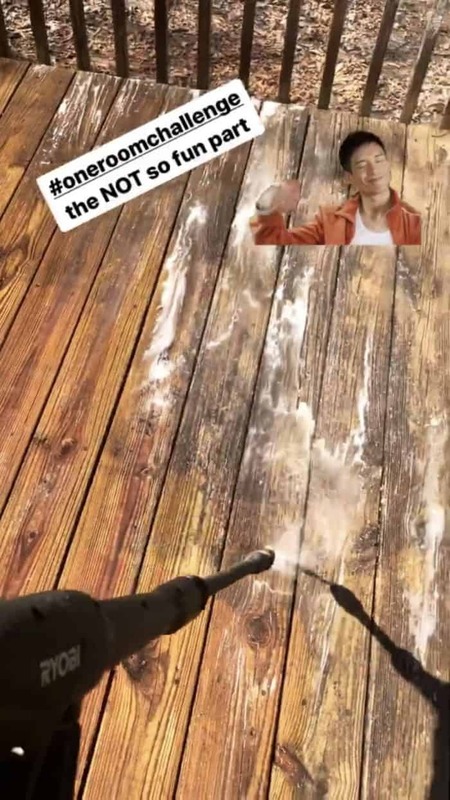 A few people said they use regular household bleach and a power washer so that is what I did. While it didn’t give me a new deck, it did work very well. I shared a few behind the scenes photos on my Instagram stories. Be sure to follow my At Home with The Barkers Instagram to keep up with things I may not share here. First thing though was the last remaining piece of lattice. It really had to go. I sprayed the deck with a pump garden sprayer in order to cover the surface fast. My Ryobi power washer did a great job. Be very careful not to use full strength spray when washing the wood or you can splinter it was the water pressure. 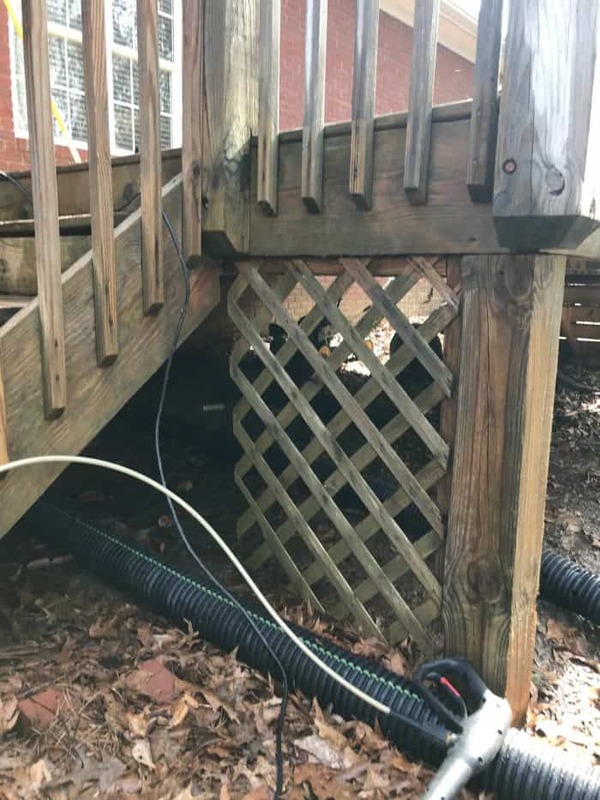 My deck is approximately 16 years old and I would honestly love to replace it with trex decking but that is not in the budget. Just be warned that you need to be careful. Leave the bleach on for 15 minutes. You can already see in this photo how the bleach made a big difference as I started the power wash process. This took my many hours to finish. Instastories are lots of fun with those GIFs. I know the wood looks warm in the below photo but once dry it still looked a much cooler gray color. BUT I was so happy to have all of the mildew off. Now it’s time for me to decide on the exact black for the fence. Any suggestions? Be sure to check out all of the participants on Linda’s Guest Link up Party!